How do you keep toddlers and preschoolers well occupied while you homeschool older children, cook dinner or make an important phone call? 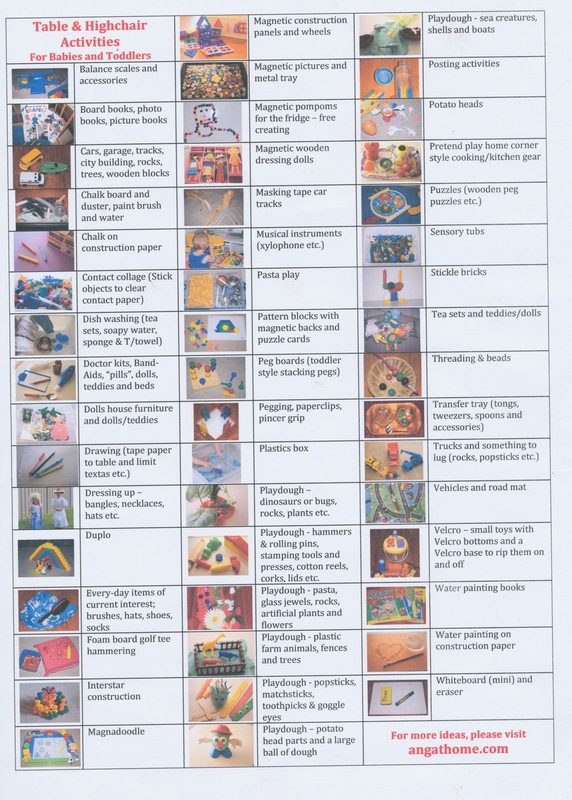 In the interest of getting organised and answering this question for myself, I have created charts of activities for 3 different age groups; babies and toddlers, preschoolers and school-aged children. Every item on these lists is not necessarily a toy or activity that I would have chosen to purchase, or recommend that you do, they are simply what we already have. With 6 children in the house there are many birthday and Christmas gifts coming in and our collection of table activities is quite extensive. I have purchased some and do have my favourites, but it is very nice to be able to rotate constantly so that there is always something “new” and fresh to do. The toddlers and very young children do not have a choice of activities. I set out what they will be working on and decide how long it will be before they are able to change. See choices, highchair activities for babies, routines & highchair time and Montessori style practical life tray activities for toddlers for practical explanations of how to get started and manage highchair time for little ones. It is a large download so it take some time to come through (lots of photos!) I had to leave it and walk away! The next two posts will include the charts of activities for preschoolers and school-aged children, so keep an eye out for those. If you would like an explanation of any of the activities, please feel free to ask. I didn’t want to clutter up the lists with too much information. I would love to hear what activities you like to give your babies and toddlers.